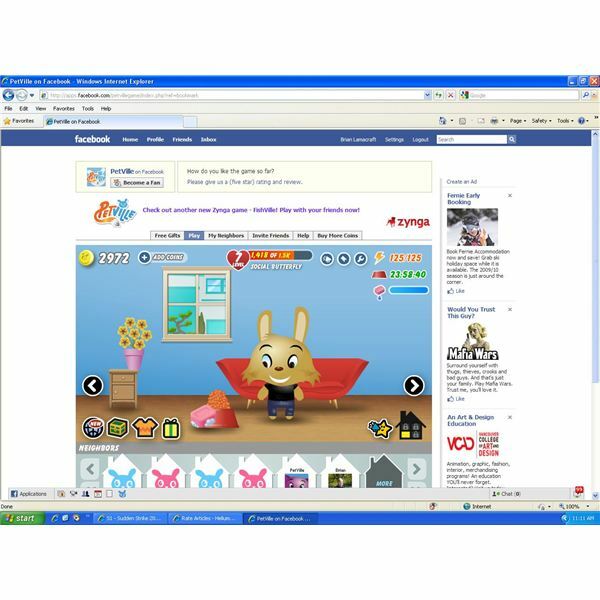 Zynga brings us Petville on Facebook, a cartoon style, pet management game. You are free to decorate your pet anyway you want by visiting different stores in the game. Each pet comes with its own house that can be decorated. You start with one room but as you advance more rooms become available to you. You need to feed your pet and wash it every time you log in. Trash items will drop on your floor that you can pick up for cash. Your pet also requires love which you can do by washing your pet and visiting your Facebook friends pets. If you don’t have any Facebook buddies you can use the Zynga Petville friend and visit their house. When you visit you can play little short games with them and move around their house. The bulk of your interaction with Petville will take place in your Pet’s home but you can go other players in the game world via the world globe icon which has several destinations. Clothing Store– Here you can purchase different items for your pet to wear. You an move around the store and see the various items on the rack. There are arrows that you can use to scroll through the items and each item has a price with some being unlocked at later levels. The store has various floors you can also access to see such things as costumes and sportswear for your pet. Furniture Store – This works just like the clothing store only here you can buy things for your home. We have dining, bed and bath, and living room floors to visit. By tables, pictures, chairs and other items to spruce up your pets home. Hardware Store – Get new flooring, windows, wallpaper, and doors by visiting the floors at this store. Makeovers – Change your pets appearance here anytime you like. Bank – Used to pay real-life cash for things or complete game offers. Playing Facebook Petville can be fun but need to keep yout pet happy and you can accomplish this with regular feeding and using your soap. Food will cost coins and if you don’t feed your pet on a regular basis it will run away but don’t worry you can get it out of the pound with cash. Different food will last longer periods so try for 24hr food so you won’t have to feed your pet as much. If you click on the food bowl you can purchase new food there. To keep your pet clean simple brush it with the soap provided for you and it will get clean. You will also get “love” which will help your pet to advance levels in the game. Petville also allows you to visit the homes of your friends pets and there is one ‘Petville” friend already added for you. When you visit your friends you can perform simple games such as hug, kiss, high-five and others. These games are not very interesting and they need to be improved, their cute nature wears thin quickly. You can only do the interactions again by hitting the “play again ”and you will get some love points to help you advance in the game. Interacting also requires energy points like some of the RPGs on Facebook do and you will need to wait until this replenishes until you can interact again. You can’t just interact all the time you need to rest until your energy recovers. You can move around your friends house and pick up the junk on the ground for game coins. You can move your pet onto furniture if you like but that is about it. The game does give you many customization options when you visit the various game stores. There are currently many different outfits you can buy for your pet as well as appearance options with a makeover. Your house can also be customized with various furniture items. The ability to change things around and decorate the way you want gives you some replay options. The way you buy items is also quite nice with the store style layout where you scroll through to see everything on the racks. Petville does look quite nice and has a very noticeable “cute” factor. This new Zynga game is perfectly suited for young girls or children who would find the game play fun and entertaining. Males on the other hand won’t get much enjoyment out of this latest Zynga game. Despite the cuteness the game does have some great customization features and hopefully with the addition of some more games to play, a greater lasting appeal. Petville is well worth trying and if you have small children, they are sure to love it. This is one Facebook game to keep your eye on.